Image: Alexander Calder, Blue Feather, c. 1948 Sheet metal, wire, and paint 42 x 55 x 18 inches (107 x 140 x 46 cm) Photo credit: Calder Foundation, New York / Art Resource, NY © 2013, Calder Foundation, New York / DACS, London, or any other relevant international copyright societies. 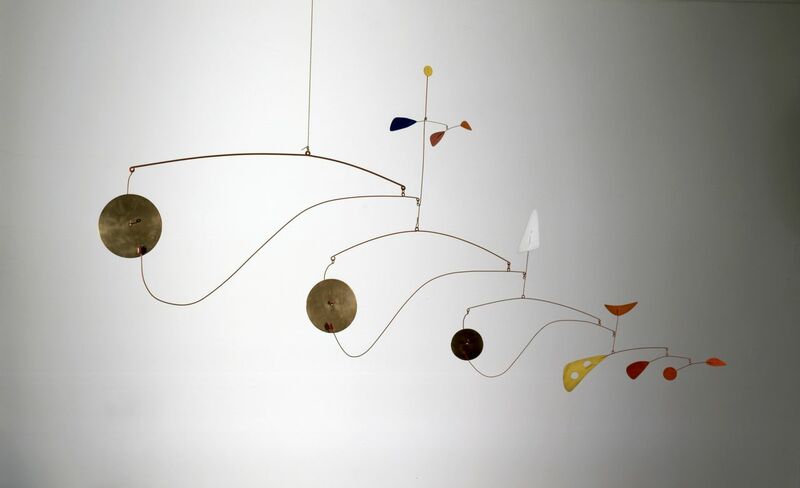 Image: Alexander Calder, Baby Flat Top, 1946 Sheet metal, wire, and paint 49 x 78 3?4 x 171?2 inches (124 x 200 x 44cm) Photo credit: Calder Foundation, New York / Art Resource, NY © 2013, Calder Foundation, New York / DACS, London, or any other relevant international copyright societies. 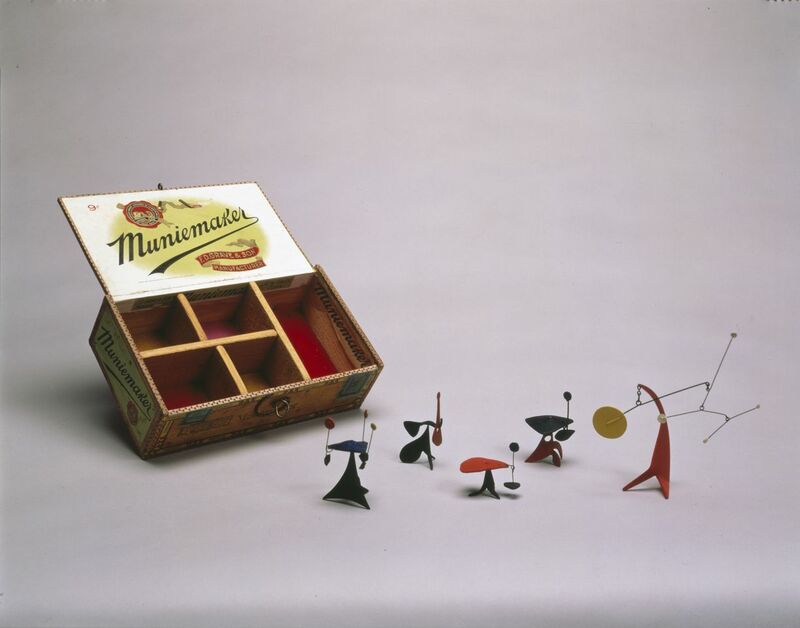 Image: Alexander Calder, Louisa’s 43rd Birthday Present, 1948 Sheet metal, wire, paint, and a felt- lined cigar box Photo credit: Calder Foundation, New York / Art Resource, NY © 2013, Calder Foundation, New York / DACS, London, or any other relevant international copyright societies. © 2013, Calder Foundation, New York / DACS, London, or any other relevant international copyright societies. A one hour discussion between Marc Glimcher, President of Pace and Alexander S.C Rower, Calder Foundation President and Alexander Calder’s grandson on Friday 19th April 2013 from 2.30 to 3.30 pm at 6 Burlington Gardens, Senate Rooms, on the first floor. RSVP is essential as space is limited: rsvp1@pacegallery.com RSVP deadline: 18th April. Sculptures and Constructions, 1944 (10 min), a film by Herbert Matter produced by the Museum of Modern Art on the occasion of their 1943 retrospective. Works of Calder, 1950 (20 min), a lyrical and experimental film by Herbert Matter with a score by John Cage investigating the artist’s practice. Pace hosts unprecedented exhibition of Calder’s sculpture, painting, and works on paper from 1945–1949 at 6 Burlington Gardens, London. Calder After the War is a comprehensive exhibition of nearly fifty works of art from the years of 1945 to 1949, widely considered to be the most important period in the artist’s career. The exhibition will be on view at Pace London, 6 Burlington Gardens from 19 April to 7 June 2013. Calder After the War will feature more than twenty-five mobiles, stabiles, and standing mobiles installed on the gallery’s ground floor. The exhibition will extend to the gallery’s newly renovated first floor, where over twenty of Calder’s rarely-seen paintings and gouaches from that same period will be on view. Masterpieces such as Baby Flat Top (1946), Little Parasite (1947), and Blue Feather (c. 1948) will be included in the exhibition, as well as distinctive works like Scarlet Digitals (1945), Red, White and Blue on Black (1948), and Louisa’s 43rd Birthday Present (1948), a collection of five miniature standing mobiles and the felt-lined cigar box that Calder created to store them. Calder’s 1930 visit to Piet Mondrian’s studio set in motion his pursuit of wholly abstract compositions in two and three dimensions. With his 1931 invention of a ground breaking form of artwork termed the “mobile” by Marcel Duchamp, Calder successfully synthesised European Abstraction, Surrealism and Dada with an American passion for invention, discovery and forces of nature. Calder’s creative genius resulted in the redefinition of art beyond composition and material, as well as the liberation of the artwork from a static base and the true participation in the three-dimensional universe. Calder’s radical new sculpture evolved over the decade until 1941, when the U.S. entered World War II, yielding an unexpected and important moment of reflection that interrupted the development of his sheet metal and wire work. Partly due to the shortage of sheet aluminium, but mostly to his own desire to reconsider his process during wartime, Calder experimented with the carved wood constructions known as Constellations, as well as the bronzes that he had first considered in the mid-1930s. 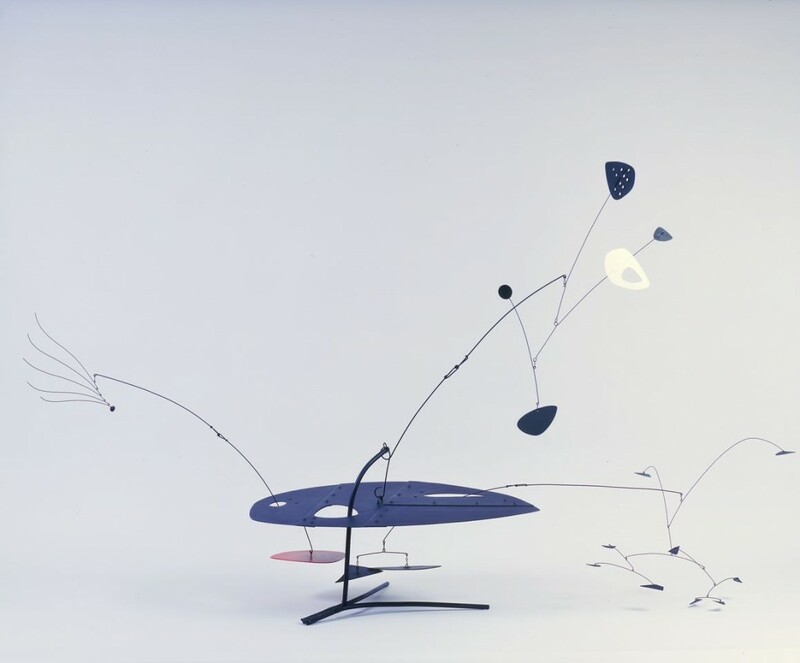 Calder After the War demonstrates the artist’s visionary engagement with form, colour, gesture, and complexity in the four years that followed. 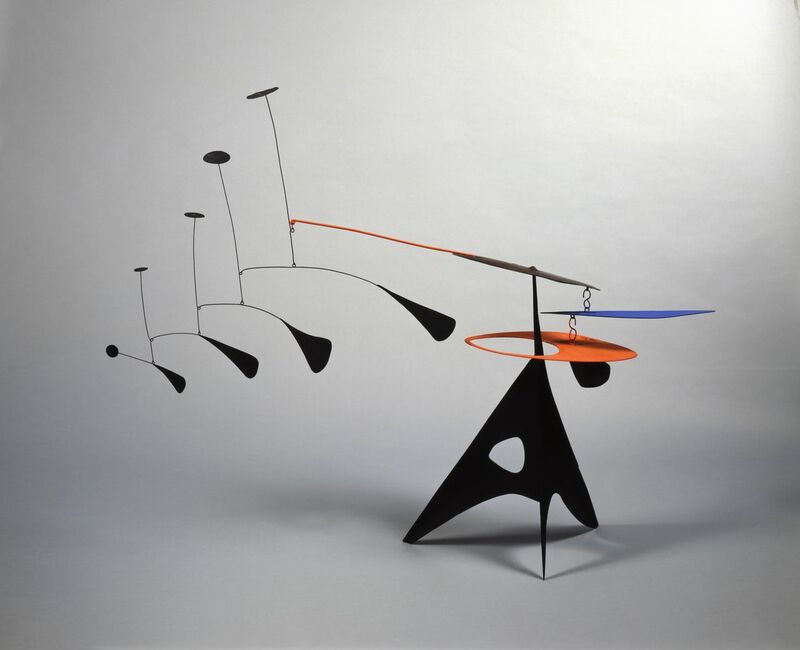 The works of this period are distinguished not only by the grace and balance of their systems, but by the intricacy, unpredictability, and interacting forces that brought the work to a radical new level, as Calder merged stabile and mobile constructions and introduced sophisticated weights and cantilevers. Eager to exhibit in Europe and abroad following the war, Calder presented some of the seminal exhibitions of his career during this period: Galerie Louis Carré, Paris, in 1946, for which Jean-Paul Sartre wrote an essay; Buchholz Gallery/Curt Valentin, New York, in 1947; the San Francisco Museum of Art in 1947; and his sojourn to Brazil in 1948. Many of the most important works from these exhibitions are represented in Calder After the War. A major catalogue, Calder After the War, with a preface by Marc Glimcher, an introduction by Sir Norman Foster and an important new essay by American art historian Barbara Rose, will accompany the exhibition. The volume will include illustrations of the works in the exhibition as well as a chronology of the period, which will include dozens of never-before-published photographs documenting the artist, his studio, and his practice. Photographs of the important exhibitions that marked the period, as well as related documentation, will also be reproduced in the chronology. Calder After the War is the second in a series of historical exhibitions focusing on seminal moments in Calder’s career, following the acclaimed Calder 1941, presented in New York in 2011. The exhibition continues Pace’s four-decade relationship with the Calder Estate, during which the gallery has presented a dozen exhibitions of the artist’s work. Alexander Calder (1898–1976) is one of the most acclaimed and influential sculptors of the twentieth century. Renowned for his invention of the mobile, a kinetic construction of suspended abstract elements that describe individual movements in changing harmony, Calder also devoted himself to making outdoor sculpture on a grand scale from bolted sheets of steel, many of which stand in public plazas in cities throughout the world. Calder’s wide body of work includes paintings, drawings, prints, book illustrations, jewellery, tapestries, and costumes and set designs for ballets and theatrical productions. Born in Pennsylvania to a family of artists, Calder received an engineering degree from Stevens Institute of Technology in 1919 and moved to New York to enroll at the Art Students League in 1923. In 1926 he travelled to Paris, where he would periodically live and work until 1933, and where he created his fabled Cirque Calder (1926–31). After visiting Piet Mondrian’s studio in 1930, Calder began experimenting with abstract constructions, exhibiting his first non-objective works in 1931. The following year he showed hand-cranked and motorised mobiles, marking the beginning of his development as a leading exponent of kinetic art. Calder remained committed to abstraction during the 1930s and introduced biomorphic forms into his kinetic sculptures, synthesising Constructivist methods and materials with abstract forms that recall Surrealist imagery. In subsequent years he refined his wind-driven mobiles, producing elegant, space-encompassing abstractions of gracefully bending wires. In the 1950s he began producing large numbers of stabiles—large-scale constructions made from cut and painted metal sheets—and simultaneously explored new forms such as Towers (wall-based wire constructions with moving elements) and Gongs (sound-producing metal pieces). During the 1960s and 1970s, Calder created colossal stabiles for public sites around the world, installing works of 45 feet and higher in many American and European cities. Alexander Calder has been the subject of dozens of exhibitions at museums worldwide, including retrospectives at the Museum of Modern Art (1943), Solomon R. Guggenheim Museum (1964), Whitney Museum of American Art (1976), and National Gallery of Art, Washington, D.C. (1998), as well as major exhibitions at museums including Museo Guggenheim Bilbao; The Art Institute of Chicago; the Centre Pompidou, Musée national d’Art Moderne, Paris; The Detroit Institute of Art; Foundation Beyeler, Riehen, Switzerland; Kunsthalle Basel; The Menil Collection, Houston; Metropolitan Museum of Art, New York; Museum of Contemporary Art, Chicago; Museum of Fine Arts, Houston; The Phillips Collection, Washington, D.C.; San Francisco Museum of Modern Art; Stedelijk Museum, Amsterdam; and Walker Art Center, Minneapolis. In 2011 his monumental standing mobile Horizontal (1974) was permanently installed in front of the Centre Pompidou in Paris. Calder’s work is in the collection of nearly every major public art institution in the United States and abroad. The exhibition is presented with the collaboration of the Calder Foundation, New York, a non-profit organization founded in 1987 dedicated to collecting, exhibiting, preserving and interpreting the art and archives of Alexander Calder and is charged with an unmatched collection of his works. The Foundation’s projects include collaborating on exhibitions and publications, organizing and maintaining the Calder archives, examining works attributed to Calder, and cataloguing the artist’s works.